When applying makeup whether for every day or for a formal event, you always want to start with having the best foundation you can. This will be your base for everything else you put on after. It all depends on how good your base looks! And having a good base all begins with having a solid complexion. And there are a lot of different things that many people find they struggle with. Tone, facial fuzz, large pores, acne, etc. Myself, I struggle with texture and acne scarring/hyperpigmentation. If I’m not careful, it can show up in pictures and as the day wears on. Taking care of your skin is important not only because it makes makeup application much easier, but also because our skin is our first defense against the environment! SO we have to take care of it. Depending on your skin type, your skin will have different needs to keep it as smooth as possible and at its strongest to both do it’s job in protecting you and to look amazing in those selfies. And on top of that, skin changes. Our eating habits, age, the type of environment we live in can all take a toll on how our skin looks. I recently found my grad pictures from high school. And let me tell you, I didn’t know it at the time, but my skin was damn near perfect. I mean, aside from a pimple now again, I never had skin issues as a teen and I did next to nothing to my skin for it to be that way. I really took it for granted. I’m not sure when the switch happened, but, something bad happened at some point in my early twenties. Maybe it’s because I started wearing more makeup. Or because I just got older. Maybe the stress from medical school and life really started showing on my face. Or because I started fussing with it too much. I do believe I had a change in my hormones simply because of where my skin problems are now, but I’m not really sure. And it’s a tough topic to deal with for a lot of people. Myself included. Honestly, it’s not that much of a pressing issue for me. Not because I’m completely happy with my skin at it’s stage now, but because I don’t feel restricted by it right now. I will go out without makeup, and feel fine. If I don’t have time to do full coverage foundation, as is the case for most days, I don’t feel bad about it. Sometimes I just don’t feel like piling it on. And I feel no way about going out to do my daily stuff with a bare face. It’s just not at that point where I want to hide my skin yet. But I feel like I might be headed in that direction though it’s not improving or getting worse right now. So, I figured I would document my progress to keep myself accountable and see if I can get to a stage where I have at the very least, clear skin. If you’d like to see how it’s going, and maybe get some tips for your skin, you might be interested in this post, and others in the future. I’m not sure how long it will take, but, I’ll document my progress as it happens. As with almost everything I do, I’ll begin by listing my goals, and then have specific ways to take care of each point. I’ll amend and tweak it as I go along as I figure out what works and what doesn’t. I feel like I have a good base point to start from since over the years I’ve seen so much change and I kind of know what works and what doesn’t. I’m trying to see if consistency is really my issue (which I think it is). I am a pimple popper. I know. It’s gross, but sometimes, I can’t resist. I know there’s a lot of people out there who say they don’t! But they do! I know. No need to pretend here. Let’s put it all out there (I sure am! ), the first step is admitting it. If you (really) don’t, good for you! One less thing to worry about. I am working on not touching my skin anymore as that is the number one thing for me that leads to scarring. I’ve become better at it lately, but I’m not perfect. I’m a work in progress. I do have dark skin with a lot of pigment, so if I don’t touch a pimple, when it goes away, I may still have a bit of a mark, but if I pop it (or attempt to), the mark always turns out way darker and then takes even longer to disappear. 2. Even my skin tone. This is my second most important goal because for me it is huge! To me it makes such a difference in how you look. And being a deep brown skin girl, just coming out of summer, let me tell you I am at least three different shades all over my body and maybe two on my face alone. It’s just uneven and I’d like to see if I can do something about that. I feel like if I can do this and clear up the scars, I’d be good to go. Once you have an even skin tone, you’re pretty much set because that’s what foundation does a lot of the time anyway. 3. Reduce texture and large pores. I don’t know how much I can do about this, but I think if I’m doing regular exfoliation I can make my skin look smoother as well as help with the dark marks. I do try to exfoliate every week, but I’m very inconsistent with it. Sometimes I forget, or I’m too busy or tired. I want to work on this, so I will. Every skin care article I’ve ever read says that exfoliation is so important at some point to clear out pores and smooth the appearance of skin. And because I don’t have sensitive skin, and it’s actually very oily, I think I would benefit from doing it more often. We shall see. As I mentioned above, I have very oily skin. Mostly in my T-zone (forehead, nose and chin), but really, I have a lot of oiliness and whiteheads all over, not many blackheads, but a few. Greasy! Overall, I don’t think oil is my enemy, I actually think it can work in my favor because back when I wasn’t SO oily (back in the high school days), I always looked dewy and fresh faced, and my skin almost never felt dry or tight. Natural moisture is good and helps you glow, so I only want to reduce it. -Cleanse with an exfoliating creamy cleanser and my Vanity Planet brush. -Wash with a mild cleanser. I will follow this routine for 2 weeks and then post an update to see if there has been any progress in the areas I made goals to improve! And I will take some before and after pictures as well to show progress (or lack of it!). Stay tuned! 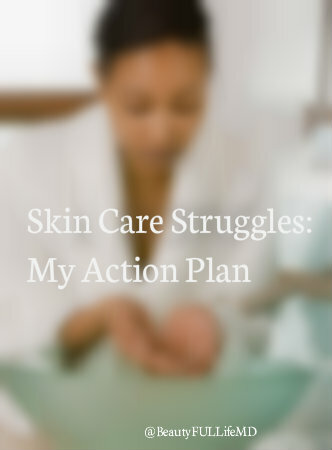 Do you have skin care struggles? Have you found anything that works for you?